The old saying “someone’s trash is someone’s treasure” certainly holds true for the World’s Longest Yard Sale, also known as The 127 Corridor Sale. Everybody loves to find a bargain. Imagine a five-state, 690-mile yard sale stretching along highway 127 from Gadsden, Alabama to Addison, Michigan. Individual families, groups of people and communities set up tables and booths to participate in the yard sale. Vendors lease fields and open spaces along the corridor to sell their wares. The event officially begins the first Thursday in August and ends the following Sunday. This year’s dates are- August 2 – 5. The massive yard sale was the brainchild of Mike Walker, a local Fentress County, Tennessee official. He envisioned the yard sale as a way to get people off the major interstates and onto America’s backroads. The first yard sale took place in 1987 along highway 127 in Fentress County, Tennessee. The Fentress County Chamber of Commerce currently serves as the yard sale’s headquarters. An excellent starting point would be where it all began – in the state of Tennessee. The Edgetrekker is a website that helps plan and organize your trip along the 127 Corridor Sale. Reserve a campsite as a home base in Crossville, which is about midway on the TN section. From there you can travel north or south checking out yard sale bargains during the weekend. You can explore local attractions the days before and after the big sale. The local Tennessee scenery is worth the trip even if you don’t buy a thing. If sandy beaches are not your idea of the perfect vacation, then you may be more inclined to spend your time in the beautiful Smoky Mountains. The Smokies are located in the southern end of the Appalachian Mountain Range. The Cherokee called them “shaconage” which means “place of the blue smoke”. A beautiful blue, hazy mist always seems to shroud the valleys and peaks of the Smoky Mountains. Gatlinburg and Pigeon Forge, Tennessee are located within 10 miles of one another in the heart of the Smoky Mountains. Visitors fondly call this tourist mecca “Myrtle Beach of the Mountains”. You will find many of the same types of entertainment here as you would along the coastal area of South Carolina. Camping is a blast in the Great Smoky Mountains and you will be sure to find something to engage every member of the family, young and old alike. There are numerous hiking trails which range in difficulty. Check out the Gatlinburg Welcome Center to plan your mountain adventure. When you are not out exploring hiking trails and the majestic mountain views you can shop, explore, and taste the local southern cuisine – you can even sample the area’s famous moonshine! Dollywood Theme Park has something for the entire family. You will find rides, restaurants, shows, and demonstrations throughout the park. Spring is the perfect time to visit Dollywood. There are three festivals scheduled for spring 2018. Festival of Nations – March 16 – April 9 If you are interested in exploring other world cultures without leaving the U.S. then you will not want to miss the Festival of Nations. You can experience live performances by an Irish bluegrass group, German stilt dancers, Caribbean steel pan orchestra, and a Mbube vocal group. These are just some of the highlights of this festival. Spring Mix Music Festival – April 11 – 29 You can hear live performances by well-known artists from a wide musical genre – country to Christian to Southern rock. T.G. Sheppard, Crystal Gayle, Amy Grant, Chonda Pierce, Marshall Tucker Band, and Atlanta Rhythm Section are a few of the artists who will be showcased. Barbeque and Bluegrass – May 25 – June 10 Bluegrass bands and barbeque…experience a true southern tradition at Dollywood. You will not be sorry you did. If exploring local shops is more your speed then you will want to be sure to check out the area in Gatlinburg known as Gatlinburg’s Historic Great Smoky Arts & Crafts Community Trail. The Tennessee Heritage Arts & Crafts Trail was established in 1937 and is the largest group of independent artisans in North America. This is an easy walking route that is an 8 mile loop of local artisans who demonstrate their crafts, answer questions, and sell their handmade goods. You will find artisans whittling, painting, sewing, weaving, carving, creating pottery, and stained glass, among other types of handmade crafts. You may discover a unique collectible to take home to remind you of your visit to the Great Smoky Mountains. Spring is the best time to plan a trip to the Great Smoky Mountains in Tennessee. There is something for everyone in the whole family: amusement parks, shopping, arts and crafts, hiking trails and much more. You may have noticed our earlier discussion about the singular celestial event that’s coming to America in 2017. To refresh your memories, we’ll be enjoying a total solar eclipse over America on August 21, 2017. A special reason we’re highlighting this opportunity for RV travel again is that AAA members can save big when renting an RV to view the solar eclipse. 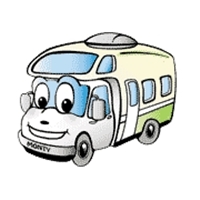 AAA members always enjoy RV rental discounts through El Monte RV Rental & Sales as part of their active membership. For this year’s total solar eclipse experience, the nationwide auto club is encouraging members to hit the road in an RV to find the optimal eclipse viewing sites. This article on the 2017 eclipse in AAA’s April member newsletter offers information on where, when and how to view the eclipse. If you aren’t currently a AAA member, this link offers you the opportunity to join so you can take advantage of the RV rental discounts. When Will the Eclipse Occur? The shadow of the moon will align to blot out the sun from our view for approximately two minutes at 10:15 a.m. PDT on the Pacific Coast near Newport, Oregon. That will be the North American debut of the 2017 solar eclipse. The moon’s shadow will then block the sun from sight in an arc across the US, moving back over the Atlantic off the South Carolina coast at 2:48 pm EDT. Where Will the Total Eclipse be Visible? This excellent map of the eclipse trajectory shows the fourteen states (from Oregon to South Carolina) crossed by the “path of totality”. On that path, there’s a sixty-mile band of optimum viewing of the entire eclipse event. Outside that band, you won’t be able to see the total eclipse and will have to settle for partial eclipse memories. Why Rent an RV to View the Eclipse? Watch local forecasts for the area where you plan to view the eclipse. If heavy cloud cover or storms are predicted, have a Plan B viewing location in mind. Traveling by RV allows you to change plans quickly. The flexibility to move to a better location as the event approaches may make the difference between awesome eclipse viewing memories and traveling home disappointed. AAA and El Monte RV Rental & Sales can help you plan the perfect eclipse viewing RV vacation, but you’ll need to act fast. Campgrounds are filling rapidly, so don’t delay any longer making your plans. Where will you be when the sun goes dark on August 21, 2017? Memphis, Tennessee is the perfect place to head in an RV this spring. This is, after all, the Home of the Blues! There is nothing like going to the birthplace of rock and roll to experience the music that makes us all tap our toes. There are plenty of other attractions and outdoor fun as well. Enjoy some of that downhome cooking. No time like the present! Naturally, you can’t miss visiting Graceland while in Memphis. Elvis Presley’s home is a definite must-see, with its rich interior and eclectic displays. One convenient point is that you will find Graceland RV Park and Campground virtually next door. You can walk to the mansion to take in all the sights. You will want to check out Shelby Farms Park for some of the outdoor fun you’ve been waiting for in Tennessee. This is a huge park, with trails for walking, hiking or biking. You’ll even get the unique opportunity to see a herd of American Bison. Some of the trails include the new 6-Mile Horseback Riding and Hiking Trail, a short loop trail around Patriot Lake, and the Chickasaw Lake Trail from where you can see the bison. If you have kids with you, be sure to stop by the Children’s Museum of Memphis so they can have fun with the interactive exhibits and learn more about our world. If they also love music, they can get up on a stage and be a star! Exploring the tree house and climbing in a real airplane cockpit are also at the top of the list of things to do here. The Davies Manor Plantation takes you back to the early days with the lovely furnishings and ambience. All year there are a number of fascinating events going on here, and if you check the schedule, you may be just in time for one or two. Seeing how folks lived in the early 19th century gives you a new look at history. Okay, now for some excitement! Eighteen miles north you will discover racing and sports events galore! The Memphis International Raceway provides family entertainment the year round. Spring is a great time to come. There is even RV parking for your convenience when the events run multiple days. What a great way to meet new people and experience one of the best racing facilities in this country. A bit further north, discover the Alex Haley Museum and Interpretive Center. A museum with amazing exhibits beckons, teaching you much about a saga that will never be forgotten – “Roots.” Celebrate this individual’s accomplishments as you look over the artifacts of an inspirational life. Of course, you can’t neglect some of the music that Memphis is famous for! Stop by the B.B. King’s Blues Club before you leave the city. Get captivated by the authentic blues music and delicious Southern dishes. This is his original club so there is no comparison! The perfect way to end a perfect RV vacation in Memphis! Take a musical journey on a stretch of highway made famous for the Mississippi Delta music that has filled the air along this byway. The Mississippi Blues Highway will take you from Memphis, TN and through Mississippi and the historic towns that were written about by many memorable blues artists. You will experience the thrill of the legendary junction of Highways 61 and 49 where a blues master sold his soul. Allow enough time to stop at the blues spots and enjoy many incredible performances along the way. the evening and a trip down the delta during the day. Hit the famous Beale Street and don’t forget to try some of the amazing barbecue in town. Travel south on Highway 61 until you reach Tunica. Go to the visitor center to find out all available for you here, because there is a lot to do and see. Tour the Blues Markers for a feel for all the musical endeavors that went down in the area. Visit the Tunica Museum for more history of a bit different nature. Admission is free, and who can pass that up? Clarksdale, a bit further down the road, offers more live music. Plenty of blues joints to visit, and a historic cotton farm to see – the Hopson Plantation. It is a pleasure to sample some of Mississippi hospitality here, and visit with other like-minded souls. The delta has its own flavor and culture which gives you a wider view of our world today. While in Clarksdale, be sure to visit the famous nightclub Ground Zero Blues Club, owned by actor Morgan Freeman. Next door you can stop by the Delta Blues Museum for another taste of history and to explore our musical heritage. Stay a while and park your RV at Coahoma County Expo Center – reasonable rates and great amenities. Taking Highway 49 south from Clarksdale, you will reach Greenwood with its wide variety of blues culture. There are three museums that display many historical artifacts. The Museum of the Mississippi Delta may not focus on the blues, but you can see many original paintings, drawings and a collection of items on the animals, antiques and agriculture of the Mississippi Delta. If you are in the area during October, don’t miss the Cotton Capital Blues Festival, a must for any blues lover. Whether you take 49 or go back to Highway 61, the rest of your trip is a pleasant one, until you get to Vicksburg, when it takes on new meaning. This is a town of importance on the Mississippi Blues Highway, but also for its part in the Civil War. You can visit Vicksburg National Military Park to discover the past. Blues clubs are abundant and you can still find a lot of toe-tapping music, as well as plenty of festivals and events that happen all year long. What an RV vacation! You will have to do this again! driving along the Newfound Gap Road, also known as US Route 441. This 33-mile road traverses the entire park, and is the only road that does so. You can drive the length of the road in one hour as part of a longer vacation, or you can stop at all of the points of interest for many hours of enjoyment. When you do this, your motorhome really comes in handy, as you can make dinner, decide to stay for the night, or just be in the comfort of your RV rental while enjoying the scenery. Be aware that the park’s busiest season is the summer tourist season in June through August, as well as leaf peepers who come to view the spectacular fall foliage in October. However, the wildflowers are in bloom as early as mid-March, and are abundant in April making for excellent motorhome vacations while the other tourists are still scarce. You can drive the route from either end, starting at Gatlinburg or Cherokee. The Sugarlands Visitor Center is located less than one mile from Gatlinburg. The visitor center can provide you with maps of the park, displays of the park’s natural history, and well-informed park rangers that can answer any of your questions regarding the best sights to see on that particular day. If it’s a warm day, you may spot other RVs on the pull-offs beside the road. Join them and splash in the crystal waters of the Little Pigeon River. After just a few miles, you’ll reach the best view in the entire park, the Campbell Overlook, where you can see Mt. LeConte, the third highest mountain in the Smoky Mountain range. If you want to leave your motorhome and walk around, you can take a “quiet walkway” that lets you see the remains of a number of homesteads that used to occupy this area of the Smokies. Look at the remnants of foundations and chimneys, and imagine what it was like to live there. Large parking areas at the trailheads allow tourists to park and either take the two mile hike to admire the ever-changing views of the Smokies, including a view of Mt. Mingus, or take the challenging five mile hike up to the LeConte Lodge and intersection with the Appalachian Trail. You can also get out and walk a short distance on the Appalachian Trail as you pass through Newfound Gap itself. An easy hike is the half mile to the observation tower on top of Clingmans Dome. From this highest point in Tennessee, you can see seven different states on a clear day. There is also a 4.2-mile round-trip hike to Andrew’s Bald, which contains truly amazing displays of flowers in June. There are also two picnic areas in the park, although you can stop and eat in the kitchen of your RV at any of the pull-offs or parking areas. Finally, you can stop at the Oconoluftee Visitor Center before leaving the park, and see the Mountain Farm Museum. This remarkable museum consists of buildings of the original pioneers that have been relocated from throughout the park. Ten Great Things to Do in Goodlettsville, Tennessee! Strategically located for fishing and hiking, fall leaf peeping tours and easy access to Nashville’s attractions, there’s always something great to do near Goodlettsville, TN! RV travelers will find dozens of historic, cultural and natural attractions within two hours’ drive of Goodlettsville. Here are ten great things to do near Goodlettsville to get you started. Belle Meade Plantation, a glorious representative of the state’s antebellum past, offers tours and educational opportunities for visitors. Relax in the slower pace as you absorb the beauty of one of Tennessee’s finest residences. Goodlettsville Antiques District is a favorite with Tennessee RV campers. Quaint shops and cafes line Main Street, tempting shoppers to spend a day hunting for treasure. Plan your day with this handy Goodlettsville Antiques District Guide. Grand Ole Opry Museum in Nashville is the heart of Music City, with performances, tours and special events sure to thrill country music fans. Check their website while making your Nashville RV campground reservations and reserve tickets to see your favorite Opry stars. Golf in Nashville – With more than two dozen golf courses in Music City and the surrounding area, you’re sure to find one that suits your style. From the Hermitage Golf Course in Old Hickory, TN to Two Rivers in Nashville, it’s a natural for RV travelers to play golf in the Goodlettsville area. Leaf Peeping in Tennessee draws millions of visitors each year, with brilliantly colored hardwood forests, fall festivals and special foliage tours. Nashville RV camping visitors can take the train to see some of the nicest foliage, thanks to the Tennessee Central Railway Museum’s vintage train tours. Land Between the Lakes National Recreation Area stretches across the Kentucky/Tennessee border two hours northwest of Goodlettsville. A lush reserve between two picturesque lakes, Land Between the Lakes is the kind of place RV campers won’t want to leave. Reserve your spot at one of the many campgrounds and then hike, fish, swim, ride horses, photograph wildlife and learn about this inland peninsula’s history to your heart’s content. Muddy Pond Mennonite Community, an hour and a half east of Nashville in Monterey, TN, is a step back in time. Visit the sorghum mill, shop at the mercantile for homemade goods and learn more about this close-knit community with no modern technology. Old Hickory Lake, twenty five miles up the Cumberland River from Nashville, has four hundred miles of shoreline and promises plenty of outdoor fun. Fantastic bass and crappie fishing, several full-service marinas and three Old Hickory Lake RV parks make this a wonderful way to spend your Nashville-area RV camping vacation. Study Tennessee’s Civil War History as memorialized by the Tennessee Civil War National Heritage Area in Murfreesboro. Whether you hike one of the Tennessee Civil War Trails or tour one of Tennessee’s many Civil War battlefields, you’ll soon learn why the Volunteer State was so pivotal in the War Between the States. Take a Cruise on the General Jackson! One of the country’s largest paddlewheel riverboats, the General Jackson cruises the Cumberland to delight Nashville visitors. Take a dinner cruise or join a Tennessee Titans tailgate cruise to the game and back (tickets are included!) No matter which riverboat cruise you select, this attraction is top-ranked by our RV camping friends. This is just a small sampling of what’s in store for you when you go RV camping in Goodlettsville, Tennessee. Contact an RV rental location to book your motorhome and get ready for a terrific time in Tennessee!